DISCLAIMER: Because SOGS is a non-profit organization, we require original receipts. We cannot accept per-diems. Although subsidy applications are available both online and in the SOGS office (Middlesex College, Room 8), SOGS only accepts hard copy subsidy applications. SOGS provides limited subsidies, up to a maximum of $500 per term, to offset the cost of child care services. The confidentiality of all applications is assured, and the general statistical information that is collected is used in our ongoing lobbying of the University for improved childcare assistance and facilities. Applications must be completed and returned by the last business day of each term. Please download the application from our Documents page. 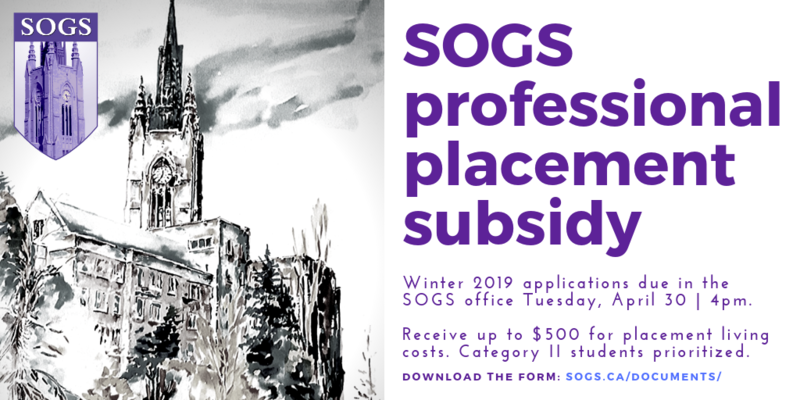 This subsidy offers financial assistance for travel and accommodations of SOGS members undertaking professional placements, practicums, co-ops, or other experiential learning opportunities. Each award amounts up to a maximum of $500 based on demonstrated need. Students who are enrolled in Category II programs (i.e., non-funded professional masters) will be given first priority. Applications must be submitted within the term when the placement or experiential learning activity ends. Deadlines are the last business day of each term in April, August and the last day of operation before the Christmas break. Please download the application form (with full details) and template letter (that is completed by your graduate administrator or supervisor) from our Documents page. Travel Subsidies are awarded up to a maximum of $500 based on demonstrated financial need. The information collected through this form is used by SOGS for internal statistical purposes. Confidentiality of all information will be maintained. Completed applications must be submitted within the term of the conference. Deadlines are the last business day of each term in April, August and the last day of operation before the Winter holiday break. Applications MUST be hard copy. If you are not physically in London, you will need to mail your application to the SOGS Office. Applications must be complete and accurate. Please read the application forms carefully. All relevant original receipts must be attached (stapled) and in order. The order corresponds to the second page of the application where students are asked to list expenses in specific categories. Submitted receipts must be the original receipts. If you have already submitted the originals to your dept./faculty for reimbursement, and that office has stamped and signed the photocopies as proof they are in possession of the original receipts. The provided income information must be more than $0. We need to know how much money you are living on for the term, regardless if it is in the form of a loan, line of credit, parental/spousal support, and/or school/government funding, etc. Applications must be printed out and provided in person. All applications should be hand-delivered or mailed to the SOGS Office (Middlesex College, Room 8). Applications must be provided by the last business day of each term.